As the Snob, one of my biggest thrills is hitting a new town and getting the chance to seek out its best pizza. In all my years of living in San Antonio, I’d made countless visits to Dallas but do not recall ever having pizza there. After Christmas, everyone wanted to head to Dallas, specifically Nordstrom’s. I decided that a side trip with my son, The Philosopher, and my nephew, The Tay-ster, was in order. We’d much rather eat pizza than shop any day. To find a place, my internet search is simple: “What’s the best pizza in (name your city)?” Honing in on Dallas, I was led to a story in alt-weekly Dallas Observer picking Dallas’s five best pizzas. Respecting how much pizzas can differ in style these days, they broke it down by categories. The one that caught my eye was Serious Pizza which they labeled “The You Tried to Hook Up But Failed Miserably Pizza.” They made it sound like the good old-fashioned late night slice that I love most. 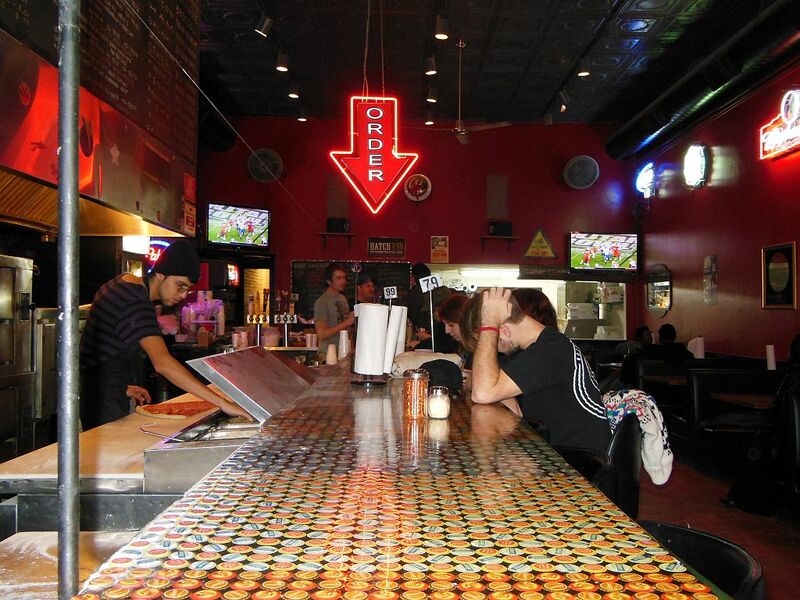 It was also in the cool, ultra-hip Deep Ellum area that lies just south of downtown. (“Ellum” is Blues-speak for “Elm,” the name of the district’s main drag.) I was ready! I fell in love with this place at first site! Outside of a few salads and calzones on the menu, it was all about pizza and specialty beers. 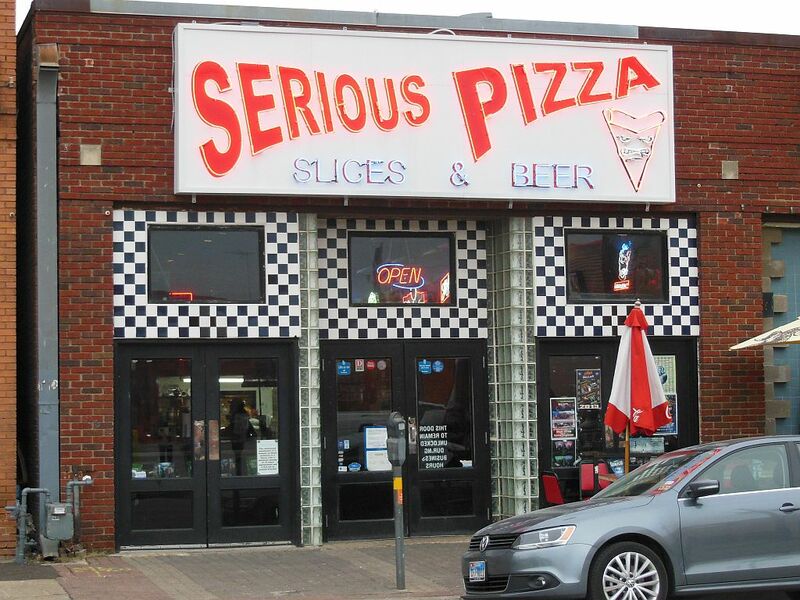 Like most places in Deep Ellum, Serious Pizza is housed in an old converted warehouse space. The high ceiling and bare walls make it a hopping vibrant place, even during the mid-afternoon hour that we visited. There was ample booth seating, but we three grabbed stools and sat at the end of the outrageously cool long bar. We ordered three cheese slices, and The Philosopher couldn’t resist a down-home Shiner Bock to wet his whistle. From the bar we were able to see our slices prepared. The chef took partially-cooked slices (“par-baked” according to the waitress) off a rack of pies that sat at the end of the bar. 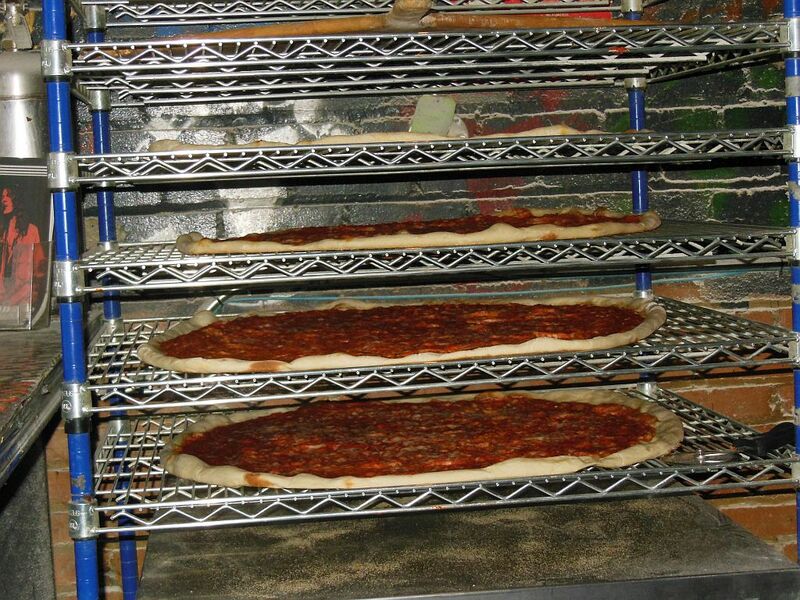 The crust was already lightly baked and laced with tomato sauce allowing the preparer to customize each slice by adding cheese and extras on top prior to tossing them in the oven. The Tay-ster went for some pepperonis which ended up being completely hidden by the covering of cheese. 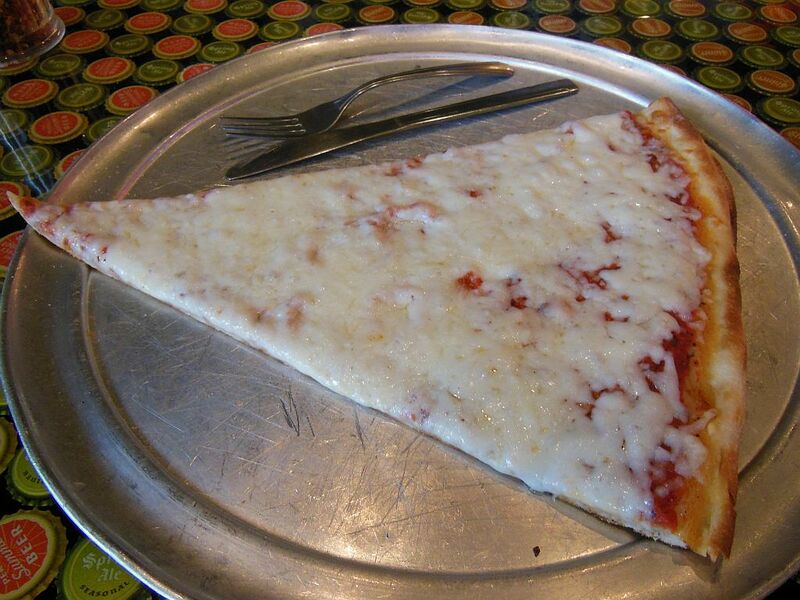 Their slices ($3.25 + $0.75 for each topping) are big—cut from a full 30-inch pie much like at Benny Tudino’s in Hoboken. Despite its rather untraditional look with cheese and sauce not blending together, my slice was enjoyably thin and downright yummy! The cheese was delicious and fresh with a slightly out of the ordinary taste. Less cheese would have helped it not be as stringy. The crust was well-toasted on the bottom, yet I think it could have been crispier. The Tay-ster really was digging the thin crust and boasted, “This is the best pizza I ever had.” While The Philosopher gave it a simple, “It’s good.” All in all, this place gets the Snob’s nod as a great spot to visit with its fun atmosphere and delightfully tasting, value-filled slices. On the way out, I chatted up the take-out guy telling him that his over-sized pizza box for the 30-inch pie certainly belongs in Philadelphia’s new Pizza Museum! I like this pizza very much and its very tasty.